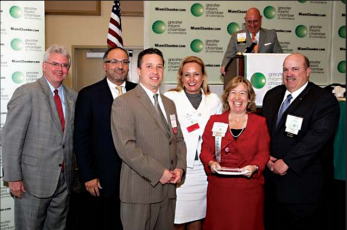 The Greater Miami Chamber of Commerce 2009 NOVO Award to The Ocean Bank Center for Educational Materials is accepted by Linda Lecht, President, The Education Fund (second from right) and Terry Curry, Ocean Bank COO (far right). MIAMI, April 2, 2009 -- The Education Fund’s Ocean Bank Center for Education Materials has received the 2009 NOVO Award from the Greater Miami Chamber of Commerce (GMCC), which honors excellence in non-profit business innovation. The Education Fund works side-by-side with the private sector to direct resources where they are needed most in Miami-Dade County Public Schools. The Education Fund fulfills its mission by designing and implementing initiatives to improve schools and bring excellence to public education. In three decades we have raised $51 million to increase academic achievement in Miami-Dade's public schools. The Education Fund’s president, Linda Lecht and Ocean Bank's COO, Terry Curry accepted the award from GMCC Chairman Carlos Guzman at the Chamber’s monthly Board of Trustees meeting. The Ocean Bank Center’s primary objective is to meet teachers' intense demand for educational tools, supplies, and resources that create the supportive environment students need to learn. Since 1993, the Ocean Bank Center has donated $8.1 million worth of supplies during 26,000 teacher visits, reaching more than 1,000,000 students. The center is housed in a centrally located, 11,000-square foot warehouse where teachers "shop for free" for classroom materials donated by more than 650 area businesses. While resources are made available to the entire district’s 20,000+ teachers in 400 public schools, its inventory of classroom supplies is especially critical to teachers in low-income neighborhoods, where students sometimes don’t even have pencils or paper. Items available at the warehouse range from the traditional staples of pencils, crayons, paper, books, and rulers to more diverse items including fabric, cardboard, and paint. Before the Ocean Bank Center, there was no mechanism in place for businesses to donate to schools. Now, with one call, a company can ensure that its goods are efficiently and effectively picked up and distributed. In fact, the center was the first facility in Florida established specifically to distribute supplies to public schools. Its success as a reuse/recycle center continues to serve as a model for similar programs across the country. The Center spawned another first-of-its-kind program upon receipt of 100 used computers. Through FamilyTech, the Ocean Bank Center solicited and refurbished computers for impoverished families. More than 10,000 needy families and 500 needy classrooms received computers, along with training for students, their parents, and teachers. FamilyTech led the way in helping our school district fully incorporate technology in the classroom.